A Google search for "#MadMen" will now produce tweets like the ones pictured above. 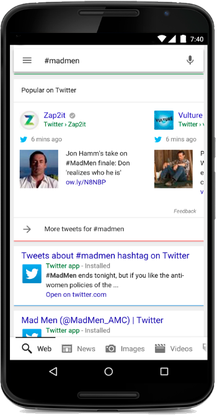 The changes, previously announced earlier this year, take effect starting Tuesday for Google's search app on iOS and Android as well as the mobile Web, for U.S. users searching in English. A desktop version is coming shortly, Twitter said in a blog post. The feature will roll out to more countries in the coming months.